A witch sends a childless baker and his wife on a task to collect a red cape, a white cow, a golden slipper, and a lock of yellow hair. The couple heads for the woods to begin their quest, where they quickly become swept up in the interwoven plots of familiar fairy tales, including Little Red Riding Hood, Jack and the Beanstalk, Cinderella and Rapunzel. Will the baker and his wife be able to complete their task on time and remove the curse that has plagued their childless family? 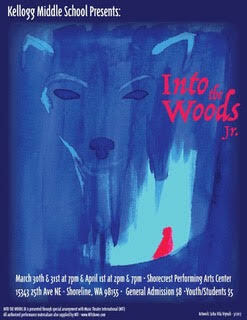 Find out this weekend when you attend the play at Shorecrest High School. Opens Thursday! This fun and comedic musical is appropriate for family audiences.